THHG Book Club: Double Feature. First up, we suggest “The American Brew”, a 50 minute walk through The United States’ long and rocky history with beer which aired on A&E and is now available on DVD. From the earliest English settlers (who found beer essential as it was healthier than the contaminated water), to the disastrous experiment with Prohibition, to the post-World War II resurgence of beer, the story is uniquely American. The contributions of immigrants and politicizing of the industry are featured, as are the rise and fall of titans of industry. With humor and insight from many of brewing’s most famous and successful families and breweries, the film takes us to the early 21stcentury, which saw the number of breweries skyrocket from 48 in 1980 to over 1500 in 2005. Discover the contributions of Louis Pasteur to brewing. Get a glimpse of how beer is judged at the World Beer Cup. It is 50 minutes very well spent. Baseball and apple pie have got nothing on beer! Be sure to watch the extras, also, which include information on the collection of breweriana, an interview with the sorely missed Michael Jackson, and much more. For a limited time, the DVD is included free with orders from www.beerbooks.com and also for sale at www.amazon.com . 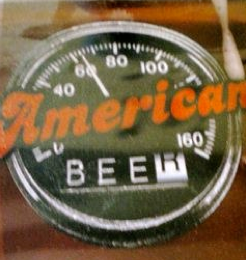 For a …quirkier…look at the world of craft beer and the devotion it inspires, we recommend “American Brew”, a road trip/beer hunt that follows five friends as they decide to visit 38 breweries in 40 days. (One of the pilgrims is Jeremy Goldberg, our friend from Cape Ann Brewing, who was so inspired by the experience that it led him to become a brewer!) Inevitably, wrong turns, overindulgence and nearly six weeks in a van with 4 friends and a camera take their toll, but there’s no denying the sheer joy and passion for the object of their quest: getting to know America’s craft brew community. Some of the finest small breweries are featured and as we learn about the brewing process we get glimpses into Dogfish Head, Ommegang, Anchor, Victory, Magic Hat, Brooklyn and many more. Ultimately, though, it’s about the journey and about finding the next great unknown. Obviously, that speaks loudly to us. And in the end, we see that even the craziest of ideas can make a change for the better. (Seriously, did you TASTE Jeremy’s Pumpkin Stout?!) Available at www.amazon.com .